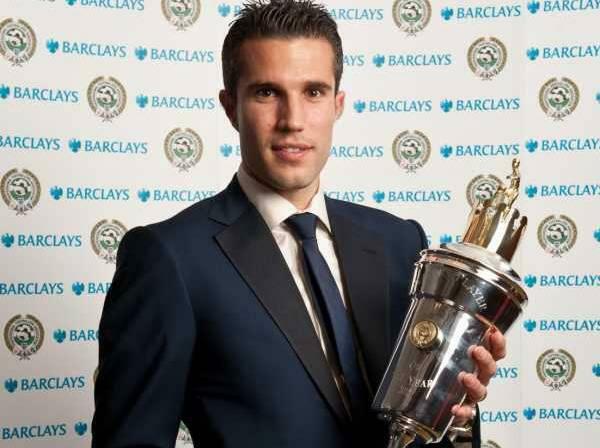 RVP Crowned King at the PFA’s + PFA’s Joke Team of the Season. Robin van Persie has expectedly been named as PFA Player of the Year, ahead of Sergio Agüero, Wayne Rooney, David Silva, Joe Hart and some other fella that should rather have been Alex Song in my opinion. Anyway, our captain was consequently named in the PFA Team of the Year as well, partnered up front by Red Devils’ striker Rooney, rendering City’s Kun Agüero conspicously missing. Newcastle United’s Fabricio Coloccini partnered Vincent Kompany at the back, ahead of either one of Laurent Koscielny or Thomas Vermaelen and I’m thinking the own goals cost Kozzer a spot there. That ‘other fella’ found his way here too; as defensive midfielder, as did Yaya Toure in central midfield, David Silva on the right and the ‘other fella’s’ teammate… the demon monkey himself appropriately on the ‘left’. A third Sp*ds player, Kyle Walker won the PFA Young Player of the Year award and was named in the right back position while Everton’s Leighton Baines got the nod for the left back position. Walker beat our own Oxlade-Chamberlain, Danny Welbeck, Chelski’s Daniel Sturridge and also completed a dire night for Agüero off the field as the Argentine was also nominated in the category. Ashley Young was named diver of the year with Luis Suarez in 2nd place and Gareth Bale in 3rd. Also, Howard Webb won the 12th man award for the 3rd year running as United’s unregistered player. Mikel Arteta won “best hair in the league”, Papiss Cisee won “how-to-pull-a-drogba/Torres-on-your-strike-partner” award. John Terry wasn’t left out as he won Racist of the year edging out Suarez again. A big congratulations to van Persie who becomes the fifth Gunner to win he award and the first Gunner since the talismatic Thierry Henry won it successive years in 2003 and 2004. All that said, what players would you have preferred to see in the PFA Team of the Year?